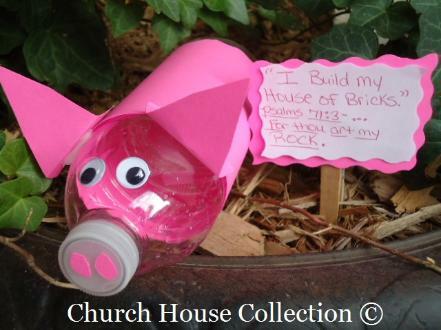 "I Build My House Of Bricks"
Have the kids take their scissors and cut the pink construction paper to fit the water bottle. Then have them wrap the pink paper around the water bottle and tape it in the back. Tape some goggle eyes to the front. Cut out two triangles for ears and then fold the bottom of the triangle backwards and add some tape to the bottom of the ear. Tape both ears on. Cut two tiny pink circles out and tape to the top of the lid for the pig's nose holes. Then have the kids take the white piece of paper and write down the words, "I Build My House Of Bricks." Psalms 71:3-.....for thou art my ROCK. Then have the child use the decorative cutting scissors and cut it out. Have them cut out a slightly larger piece of pink paper using the same decorative cutting scissors and tape behind the white paper. Then tape the paper onto the wooden clothespin. Have the child prop the sign next to their piggy. You could also add a curly pink tail by cutting out a small tail from the construction paper and taping it on or you could use pink pipe cleaner and attach it. You could also turn this craft into a little piggy bank. Just use a knife and cut a slit in the top of the bottle for the children. You could also give him little feet if you wanted to. You could make pig feet using other soda lids and tape them on. This pig craft goes with "The Three Little Pigs And The Big Bad Wolf Lesson".